Test Card F is a test card that was created by the BBC and used on television in the United Kingdom and in countries elsewhere in the world for more than four decades. Like other test cards, it was usually shown while no programmes were being broadcast. It was the first to be transmitted in colour in the UK and the first to feature a person, and has become an iconic British image regularly subject to parody. The central image on the card shows eight-year-old Carole Hersee playing noughts and crosses with a clown doll, Bubbles the Clown, surrounded by various greyscales and colour test signals needed to ensure a correct picture. It was first broadcast on 2 July 1967 (the day after the first colour pictures appeared to the public on television) on BBC2. The card was developed by a BBC engineer, George Hersee (1924-2001), father of the girl in the central image. It was frequently broadcast during downtime on BBC1 until that channel went fully 24 hours in November 1997, and on BBC Two until its downtime was replaced entirely by Pages from Ceefax in 1998, after which it was only seen during engineering work, and was last seen in this role in 1999. The card was also seen on ITV in the 1970s. Test Card J, Test Card W and Test Card X, which are digitally enhanced, widescreen and high definition versions respectively, have replaced it, although they are very infrequently broadcast because the BBC now broadcasts BBC News and promo loops of programmes shown on the channel on its terrestrial channels during downtime. Testcards now only appear during the annual RBS (rebroadcast standby) Test Transmissions and, until 2013, during the BBC HD preview loop, which used Test Card X. Virtually all the designs and patterns on the card have some significance. Along the top are 95% colour-bars in descending order of luminance – white, yellow, cyan, green, magenta, red, blue and black. There are triangles on each of the four sides of the card to check for correct overscanning of the picture. Standard greyscale and frequency response tests are found on the left and right respectively of the central picture. On the updated Test Card J, the X on the noughts-and-crosses board is an indicator for aligning the centre of the screen. The blocks of colour on the sides would cause the picture to tear horizontally if the sync circuits were not adjusted properly. The closely spaced lines in various parts of the screen allowed focus to be checked from centre to edge; mistuning would also blur the lines. All parts of the greyscale would not be distinct if contrast and brightness (both internal preset settings and user adjustments) were not set correctly. The black bar on a white background revealed ringing and signal reflections. The castellations along the top and bottom also revealed possible setup problems. A child was depicted so that wrong skin colour would be obvious and not subject to changing make-up fashions. The juxtaposed garish colours of the clown were such that a common transmission error called chrominance/luminance delay inequality would make the clown’s yellow buttons turn white. Modern circuitry using large-scale integration is much less susceptible to most of these problems. Some of them are also associated with cathode ray tubes; liquid crystal displays (LCDs), that are not scanned at high speed, also help. The test card was a vital tool in its day, but has become far less important. The name of the broadcasting channel usually appeared in the space underneath the letter F — a sans-serif F denoting an original optical version of the test card. Originally, Test Card F was a photographic slide made up of two transparencies in perfect registration—one containing the colour information and the other the monochrome background. The card was converted to electronic form in 1984 when electronic storage became possible. Carole Hersee (born 25 November 1958 in Redhill, Surrey) is a costume designer who is best known for appearing in the centrepiece of the iconic Test Card F (and latterly J, W, and X), which aired on BBC Television from 1967 to 1998. As such she became the most aired face in British television history. The card was developed in 1967 by her father, BBC engineer George Hersee, who started by snapping test photographs of Carole and her younger sister, Gillian, with Carole ultimately being chosen to appear on the card simply because Gillian was without her two front teeth at the time. She was posed with a strategically placed Noughts and Crosses board (the “X” painted in the left centre square was directly in the middle of the screen) and her own clown doll named Bubbles, which was brought on set specifically for the photo shoot. She was paid £100 for the shoot. The card was used on television in the UK and elsewhere for more than four decades, usually while there was no on-air programming. Because of the card’s prolonged exposure on the BBC, Hersee received fan mail during her teenage years and was regularly contacted by media outlets for interviews, she quickly tired of the publicity. According to a November 2006 article featuring test card enthusiast Keith Hamer, Hersee is in the Guinness Book of World Records for the longest television appearance in history — an estimated total of 70,000 hours, equivalent to nearly eight continuous years. However, she denied this in a May 2007 interview with The Telegraph, saying, “[It] can’t be put in the Guinness Book of Records because it isn’t a record that somebody else can achieve, apparently.” Hersee still owns the Bubbles doll, which she today keeps stored inside a box. Hersee went on to attend Heath End School in Farnham, and as an adult became a seamstress for a supplier of theatrical costumes. She has designed costumes for several West End theatre productions and films, including The Last Emperor, Flash Gordon and Dangerous Liaisons. Along with his Test Card F co-star Carole Hersee, Bubbles has appeared for an estimated total of 70,000 hours on television, equivalent to nearly eight whole years, which is more than any living person other than Carole (who still owns Bubbles). Bubbles’ original body colour was blue and white, but the BBC engineers decided that green was also needed within the scene as the other two television primary colours, red and blue, were already shown. A green wrap was made to cover his body and this can be seen in Test Cards J and W, along with more of his body shown in the photograph, revealing the fact that he is actually holding a piece of chalk, which was not previously visible. However, the shade of green material chosen was too subtle for the engineers’ liking and so Bubbles’ body colour in Test Card F was retouched (this can be seen from the edges of his image) to make it more saturated and also to give it a higher luminance value on screen. Colour TV presented new problems. It was deemed necessary to include a picture of a person on the new test card so adjustments could be made for flesh tones. BBC engineer George Hersee sent off some snapshots of his daughters, Carole and Gillian, for a mock-up of Test Card F, not thinking either of the girls would actually make it to the screen. The props surrounding Carole – the stuffed toy (clown) and blackboard – serve a purpose. The chalk cross was cunningly located to help engineers centre your TV picture. Mr Hersee once admitted the BBC considered using an Asian model with a bindi forehead marking to fulfil this role. However, the white cross on its black background proved more versatile. With colour images made up of overlapping red, green and blue, poor “convergence” of these shows up as “colour fringing” on the cross. Even the somewhat clown had a technical purpose. Colour TVs filter red, green and blue signals from the black and white ones and decode them separately. This process causes the colours to be delayed. If black and white aren’t properly held back too your TV suffers a dreaded chrominance/luminance delay error. If that is the case, the yellow of the clown’s buttons jumps to the right, leaving the buttons themselves plain white. 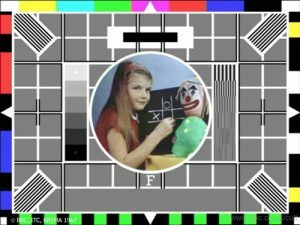 Test Card F has been used around the world – with some foreign broadcasters choosing to replace Carole with a local child. Since the late 1990s, Bubbles has only very rarely appeared on television as Test Card F has been discontinued, and Test Cards J and W are very seldom shown due to the advent of digital television and 24-hour programming. For the fortieth anniversary of Test Card F, there has been renewed interest in Bubbles in the media; in a 2007 interview, Hersee mentioned that she took Bubbles into school with her to prove to her headmaster that she really was the girl in the picture. The BBC website’s ‘500’ Internal Error page features Bubbles next to a blackboard but with fire in the background. Test Card F has been used in a number of countries around the world.